Golden Tech’s Compass Sport has a comfortable sleek design built for optimal obstacle climbing and maneuverability. With six wheels on the ground at all times, you can ensure your ride will be safe, smooth and stable wherever you go. 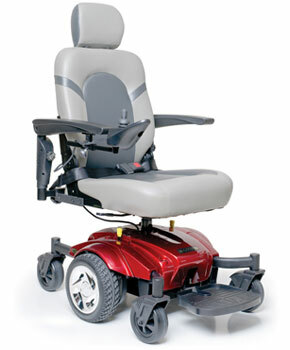 The Compass Sport is also equipped with a height adjustable two-tone Captain’s seat available in two different color combinations and a frame option of red or blue, you can customize this power chair to your liking. The Compass Sport is available in 16″, 18″ and 20″ standard seat widths, and an upgraded 22″ wide seat. It is the only chair in its price range available with such a range of seat sizes. Not only is it available in four different seat widths, but all standard seats are high-back Captain’s seats with a headrest.Not only is this chair stylish, but its sleek design allows for a 19.5” turning radius to conquer the tightest of spaces and a 15 mile drive range per full battery charge.The Compass Sport is a perfect choice for active users who like to be out and about but need the mobility convenience of a power chair. The Compass Sport features the new Dynamic Linx controller, a patented load compensating technology that provides a better rider experience. The new technology makes it easier to learn and a more natural experience, while improving the terrain climbing ability of the Compass Sport. 39″ Unit Weight: 182 lbs.